The test takes place in Institut Le Bel (University of Strasbourg ) 4, rue Blaise Pascal STRASBOURG. - direct access from Strasbourg train station: take the tram line “C” heading towards “Neuhof Rodolphe Reuss” for approximately 15 minutes. 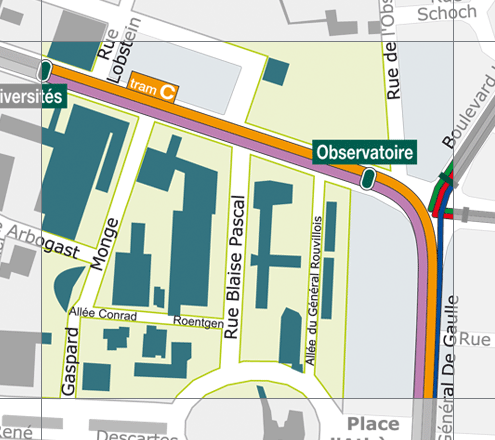 - 2 minutes walk from tram station “Observatoire” (served by tram lines “C”, “E” and “F”). For further information about Strasbourg’s bus and tram service, please see: http://www.cts-strasbourg.eu/en/. Please come at the day, time and place indicated below, with your Test Voucher and a picture ID (ID card or Passport): your identity will be checked before you are admitted in the examination room.